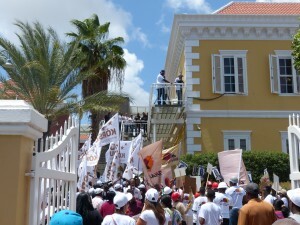 WILLEMSTAD – Before transferring power to an interim government, former Prime Minister Hensley Koeiman requested international observers for the elections that will take place on April 28 this year. The request was made to the Kingdom Minister of Foreign Affairs Bert Koenders. The Organization of American States (OAS) and CARICOM have pledged to send observers to the island to oversee the elections. OAS and CARICOM have already responded positively. Koenders announced this last Friday to Prime Minister Gilmar Pisas who was still formally responsible for organizing the elections. Koenders is confident that the observers of the election will contribute positively to the democratic process of free and fair elections in Curaçao.